Named in honor of Richard Gollin, Professor Emeritus of English and founder of the Film and Media Studies (FMS) Program, the annual festival gives University of Rochester undergraduates the opportunity to gain recognition, see their films on the big screen, and win cash prizes. All prize money is sponsored by a generous endowment from Mr. Gollin. A panel of faculty members associated with the FMS program selects the winners and honorable mentions. On the evening of the festival, student films will be screened and winners will be announced. Cash prizes are awarded to the first, second, and third place filmmakers. The festival is open to all currently enrolled University of Rochester undergraduates. Each student can submit up to two films. Please note that these films must have been created since enrollment at Rochester. Moving images can be shot on or created in any media, or using a variety of media including cell phones, video, hi-8, 16mm, .gif animations, flash, etc. 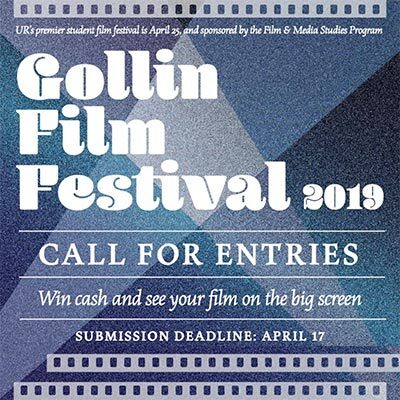 You must add " Gollin 2019 Entry / " before your film title when uploading (example: Gollin 2019 Entry / Film Title) AND enter your first and last name in the description. The deadline for entries is April 17, 2019. If you have any questions, please contact Juliet Carello at juliet.carello@rochester.edu.